Alexandre Hogue (OK, TX, MO, 1898-1994), "The Gate – Taos." 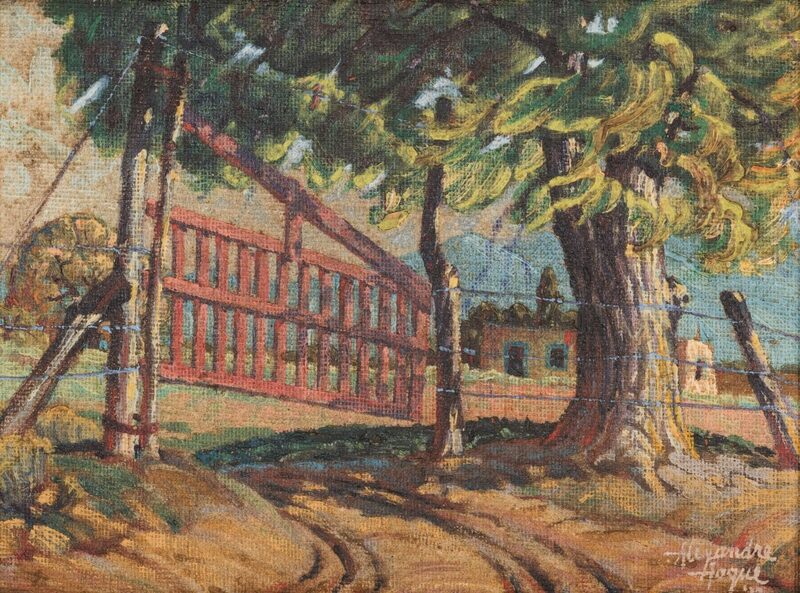 Oil on artist's board landscape painting depicting a fence with a red gate and a large tree with pueblo in the background. 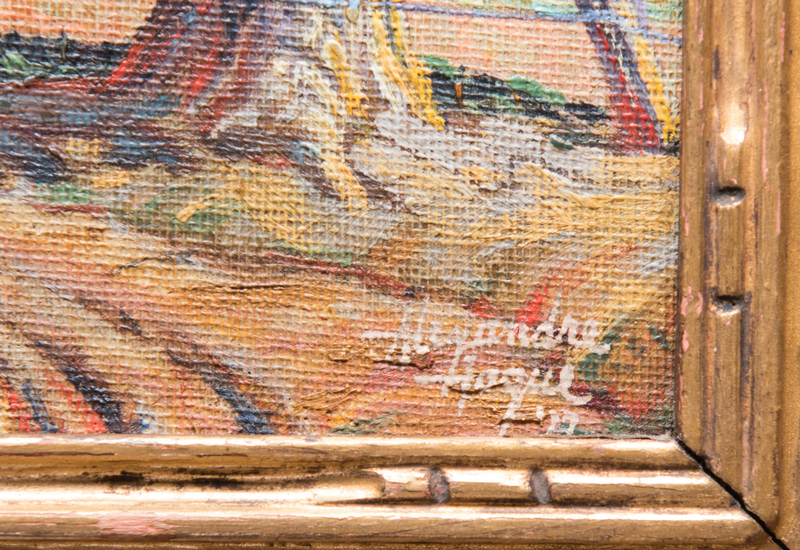 Signed and dated: Alexandre Hogue /'27 lower right. 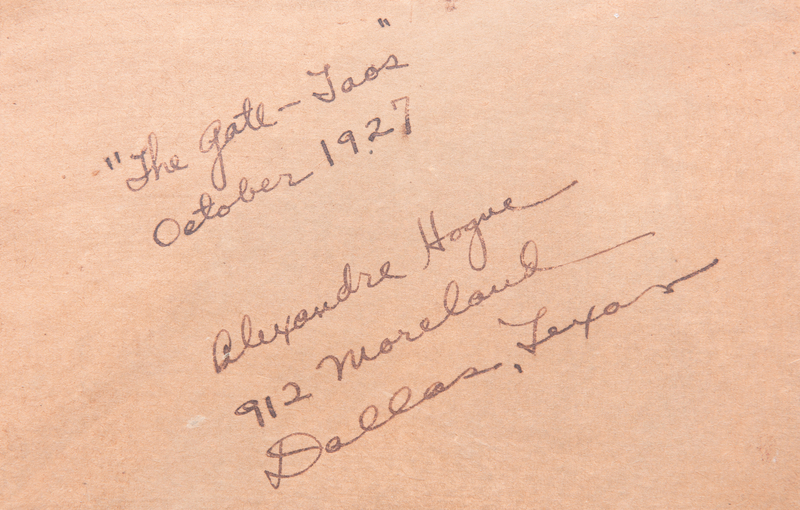 Titled, signed, and dated: The gate-Taos/October 1927/Alexandre Hogue, with artist's address: 912 Moreland Dallas, Texas, en verso. 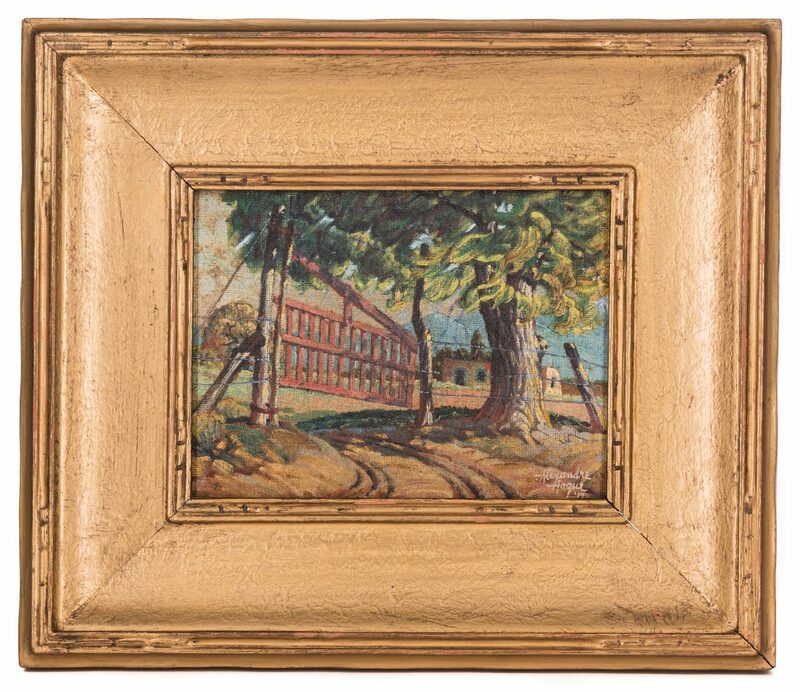 Housed in original gilded Art and Crafts frame, 2-3/4" wide. 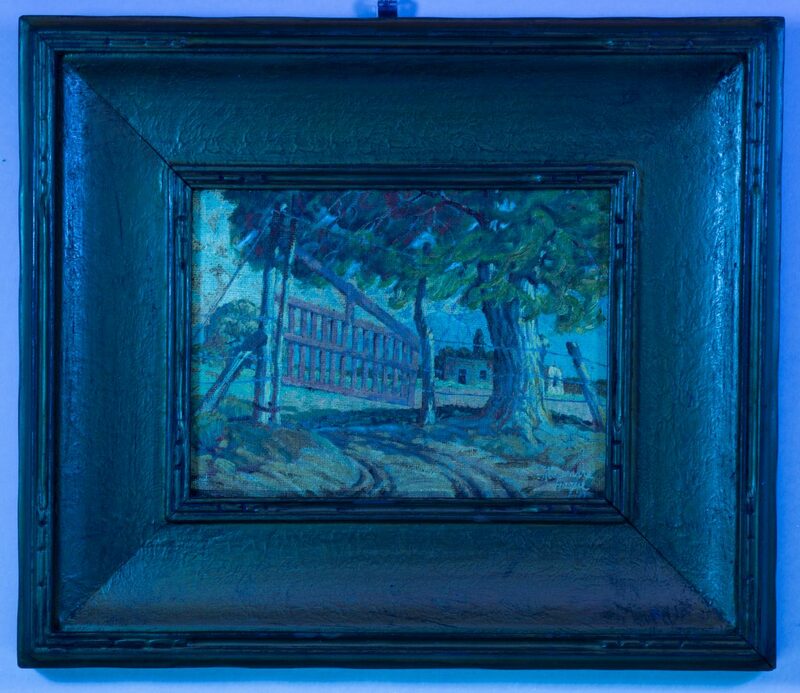 Board: 6" H x 8" W. Framed – 11 3/4" H x 13 1/2" W. American, early 20th century. Biography (courtesy Askart: The Artists' Bluebook): Alexander Hogue was a painter, printmaker, and muralist known for his Dust Bowl series and early 20th-century depictions of Indian life in Taos, New Mexico. In Taos, where he first arrived in 1926, he was especially interested in the Pueblo Indians' spiritual lives and relationship to the land. From 1945, he held an art faculty position at The University of Tulsa in Oklahoma, having taught earlier at Texas State College for Women in Denton, and the Hockaday School for Girls in Dallas. His formal art education was at the College of Art and Design in Minneapolis, and he was a student of Texas artist Frank Reaugh. He was an illustrator and cartoonist for the Dallas Times-Herald, and in Texas did black and white lithographs of the oil fields. In Dallas, he lived at 912 Moreland Street. 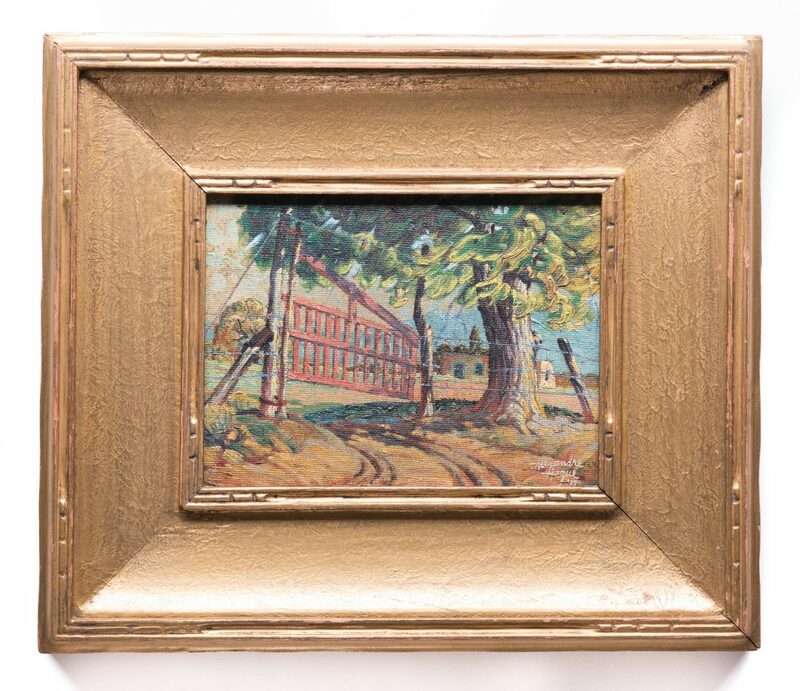 His works are included in the following museums: Musee National D'Art Moderen Pompidou Center Paris, Dallas Museum of Art, Museum of Fine Arts Houston, Harry Ranson Center University of Texas at Austin and the Art Museum of South Texas. 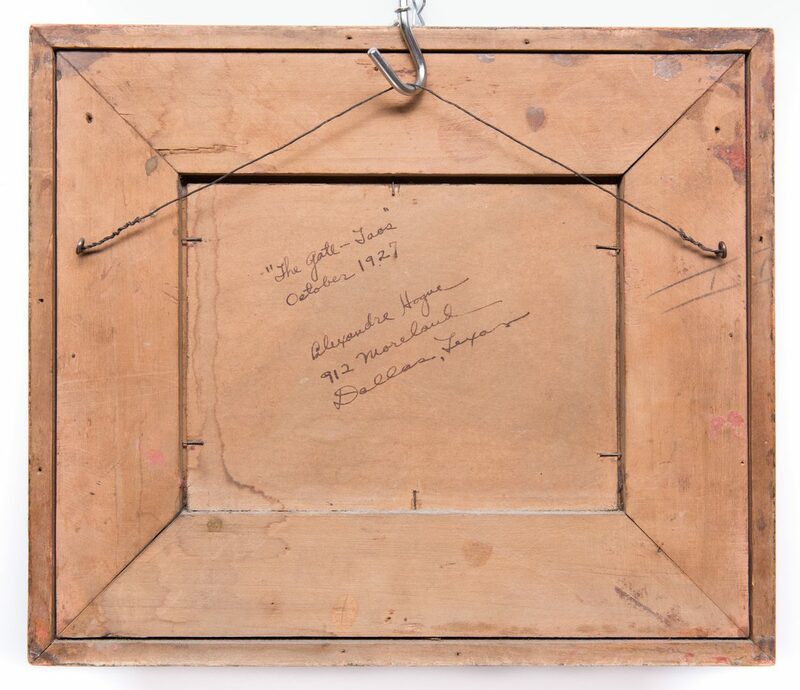 Provenance: Painting was acquired by one of Hogue's fellow art teachers in Tulsa and descended in the family. CONDITION: Overall excellent condition. Moderate grime and varnish discoloration to sky, top left of board. 6" x 2" area of dampstaining, en verso. Construction of frame slightly loose.